Teaching practices are the ‘heartbeat’ of GP training and education in our region, with experienced supervisors providing ongoing mentoring and support for GP registrars. All our teaching practices are accredited for training and our supervisors undertake ongoing professional development in teaching to ensure that they have the skills to support and teach registrars within their practice. 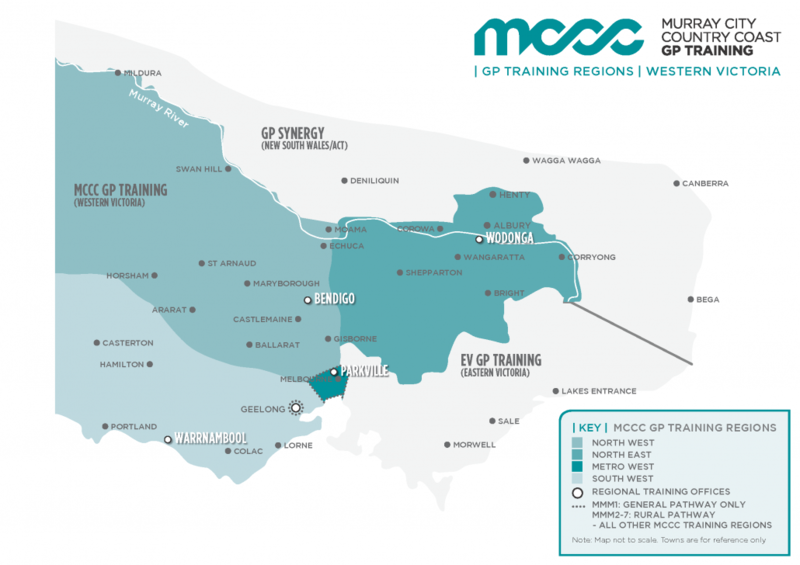 MCCC GP Training offers diverse, high quality education and training opportunities across an area that includes rural, regional, remote, outer-metropolitan and metropolitan settings. Our training footprint spans across Victoria through our North East, North West and South West regions and the Metro West area which covers approximately 40 per cent of Melbourne’s population base. Our experienced medical educators and GP training program team members are located in four regional offices that align with our diverse communities of interest: Wodonga, Bendigo, Warrnambool and Parkville. MCCC provides GP Training in four regions across Victoria. Click the name of the region on the live map below to view a list of practices and read detailed practice profiles outlining the skills and opportunities provided by the post. These lists give details of the practices located in each region, but are NOT a list of current vacancies. Please contact your region’s REAPS Coordinator for further information on current vacancies. You can also search by region below the map, for a full list of practices in each MCCC region. If you would like to see our Special Skills posts, please click the button below.